about 1997 or so. The Sandcast 1974 I bought about 6 years ago and it had good optics and those wonderful mechanicals of a sandcast. The 1978 was a rescue scope. Badly damaged coatings required a recoat. after recoating and careful reassembly it delivers nice bright images and has surprisingly good optics. 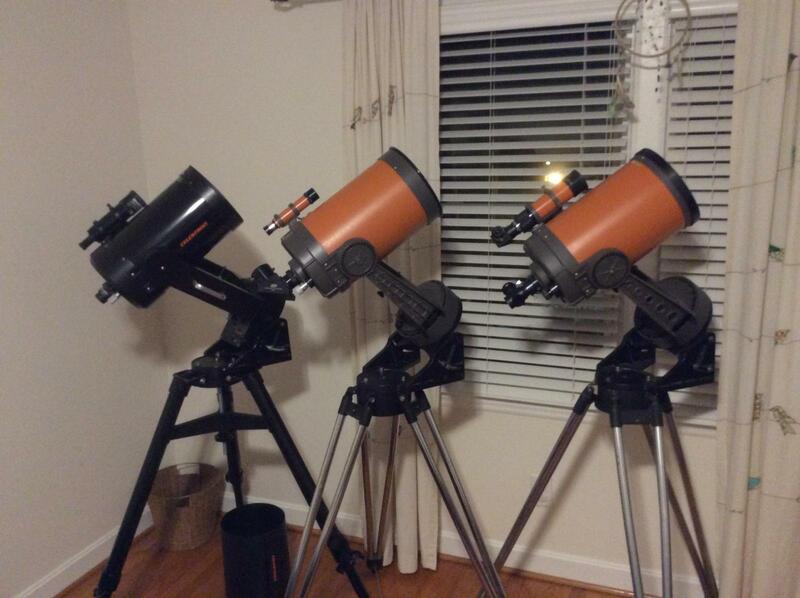 The black one was donated to our club by a former member and it will be used for outreach. That one isn't mine so technically I only have two. Took the black one for a test flight and it performed well and is in pristine condition. Also worthy of note are the tripods. That original 1974 tripod is very robust. I still have the one from my old C-5 from around 1974. I sold the C-5 but kept the wedge and tripod for my 1985 Super C-8 Plus. The tripod can easily support my 185 lb. (84 kg.) weight when I sit on the top platform. Yes, The early tripod is robust. Unfortunately, I don't have the early wedge for the sandcast C8. The scope came with the later wedge. I'm going to get another club member to care for the black C8. He comes to outreach all the time and needs a scope.